Home» » Food Corporation of India (FCI) Watchman Recruitment Notification/Application form. Food Corporation of India (FCI) Watchman Recruitment Notification/Application form. Food Corporation of India AP/TS FCI Watchman Recruitment Notification/Application form Download at fciregionaljobs.com/AP/TS FCI Watchman Recruitment Notification 2018 Job Vacancy list How to Apply Application Education Qualifications Age limit Physical Test particuls written test Examination Pattern at fciregionaljobs.com. The Food Corporation of India (FCI) under the Ministry of Consumer Affairs, Food and Public Distribution is established under the Food Corporations Act, 1964 (Act No.37 of 1964) is one of the largest Public Sector Undertaking dealing with food grain supply-chain management, invites online application for the Post of Watchman for manning in its Depots and offices of Andhra Pradesh, Andaman and Nicobar Group of Islands and Telangana. FCI management. The candidates will have no right of claim for post, if the number of vacancies decreases. 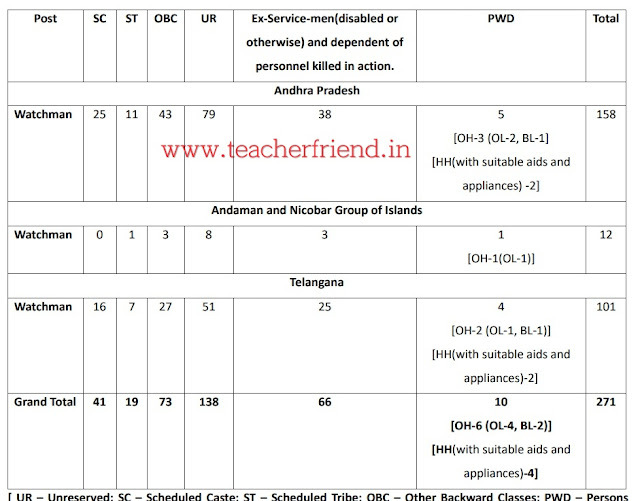 claiming benefits of reservation under Ex-Servicemen category. However, they are eligible for age relaxation only). The persons with the Degree of Disability of 40% and above are eligible for applying for the posts earmarked for PWD/PH Category. 1. Minimum Age as on 01/07/2017: 18 years, Maximum Age as on 01/07/2017: 25 years. All questions will carry 1 mark each. There will be no negative marking. The Question Papers for Written Test will be Trilingual i.e. in English, Hindi and Telugu. The candidate has to choose his / her language for written test while applying. circumstances for screened candidates on the basis of performance in written test and decision regarding calling such number of candidates shall be decided by FCI only. Physical Endurance Test will be conducted for the candidates based on the merit list of the Written Test at the ratio of 3 candidates for every post to be filed. The Physical Endurance Test (PET) is of qualifying nature only. Pregnancy at the time of PET will be considered a qualification and such candidates shall be rejected at this stage. No other Qualification other than explicitly mentioned in the Qualification Criteria would be accepted. www.fciregionaljobs.com. A candidate has to appear in all the phases of the recruitment process to be eligible for the selection. The candidates are advised to keep in touch through the Website. Application Fee To Be Paid Rs. 250/- (Excluding bank charges). Corrigendum or Addendum to this advertisement, if any, shall be published only on the website www.fciweb.nic.in : www.fciregionaljobs.com . Candidates may keep in touch through the website www.fciregionaljobs.com for regular updates.